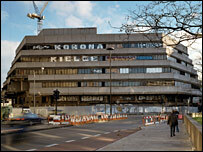 One of London's most hated eyesores is being razed to the ground to make way for a £300m luxury hotel. The vast concrete County Hall Island Block apartments on the South Bank next to Waterloo station belonged to the now-defunct Greater London Council. Having stood empty for 20 years, the block, built in 1970, is to be demolished over the next four months. 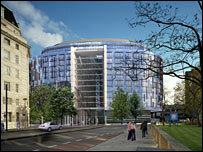 By 2010, Westminster Bridge Park Plaza will rise 14 storeys high to overlook Big Ben and the Houses of Parliament. The job of setting the bulldozers in motion fell to six-year-old Harrison Richards, from Oakley Green in Berkshire. He lives with Wilms Tumour, a cancer of the kidney, and was granted his wish by the charity, Make-a-Wish Foundation UK. Last year, the six-floor block was named as the 11th ugliest building in Britain by a poll for Channel 4 programme Demolition, coming two places behind London's highest entry, the Tower in Colliers Wood in south-west London. But despite its lack of popularity, it seems not everyone will be happy to see No 1 Westminster Bridge Road go. Architect John Bancroft, who formerly worked for the Greater London Council, said the block should have been listed. "I am absolutely devastated," he said. "I consider that it was a distinguished building and it was an early open plan office building, when open plan was not all that common. "I always thought it should have received a listing in with County Hall."